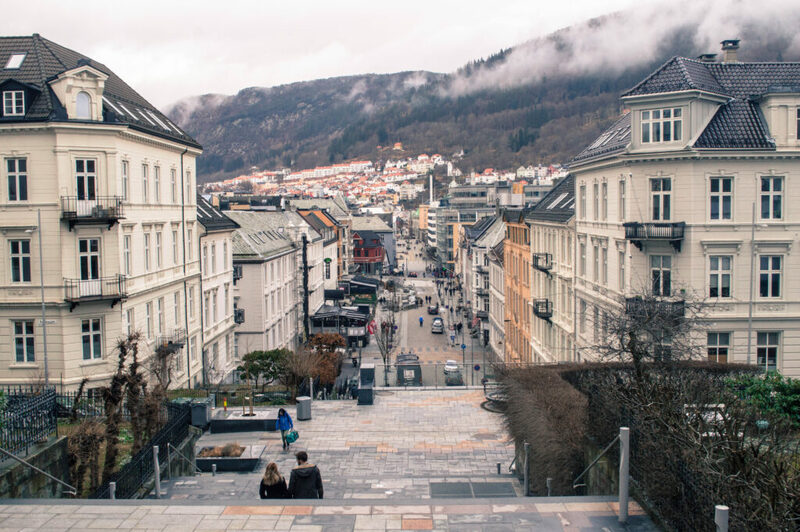 Should you visit Bergen on your next Euro trip? You can read all about my experience below! It should come as no surprise to you all that when I’m not busy stuffing my face with food or frolicking through the streets, much of my time is devoted to daydreaming of beautiful, faraway places. 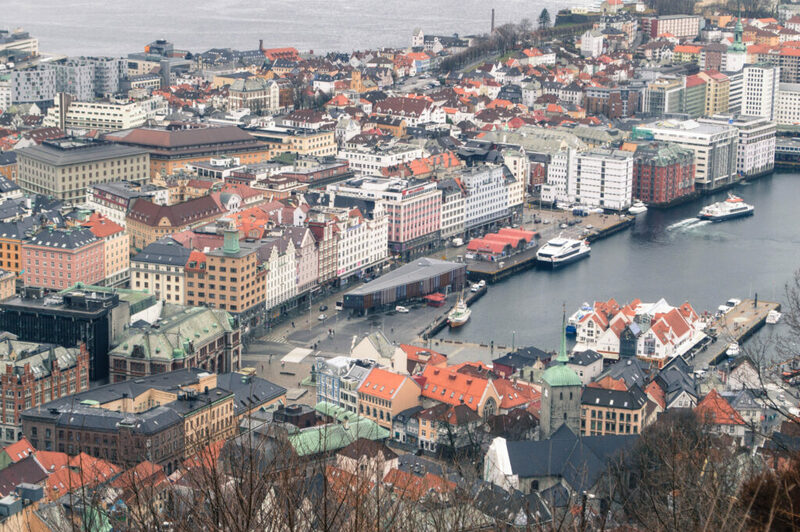 With a limited amount of time, I chose to skip the Norwegian capital of Oslo and head straight west to visit Bergen, known to many as the Gateway to the Fjords. 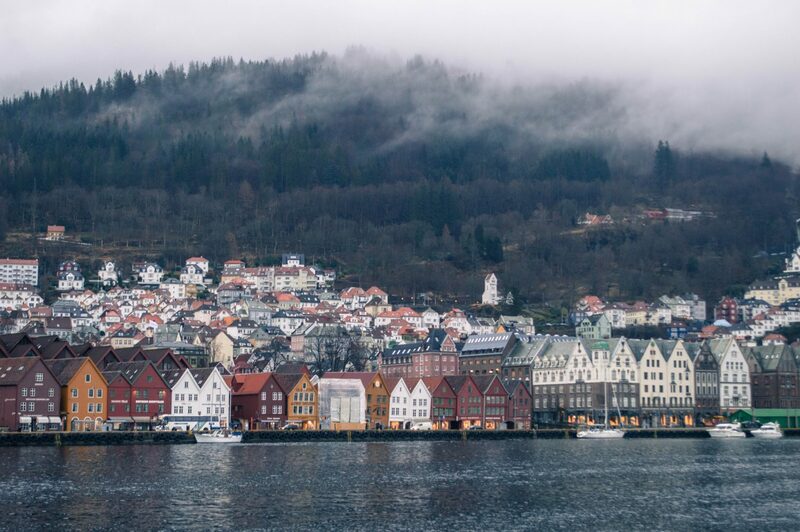 Bergen is the second largest city in Norway, but with its irresistible small town feel, you’d never think it. Charming pastel houses dot the city’s little streets, while timbered Hanseatic buildings colour the historic wharf in shades of brown, red and yellow. I spent a few days here absorbing the quaint maritime ambiance of Norway’s rainiest city, and am hoping that my photos will convince you to do the same! As expected, the March weather was rather dreary, with swirls of fog obscuring the skies and an ever-present drizzle to uphold Bergen’s reputation as the “Rainy City”. Still, to be breathing in the crisp mountain air, and to be walking along the brilliant seaside, I felt very much at home. 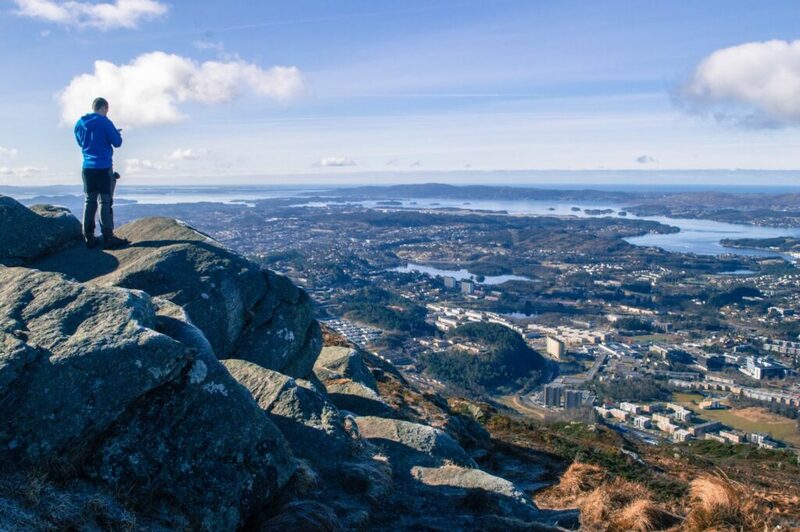 With a city centre nestled between seven mountains, Bergen is a paradise for hikers and outdoor enthusiasts. Given the city’s notoriously rainy weather, come any sunny day, the streets are flooded with excited Norweigans in neon active wear. Due to time constraints and poor weather conditions, I wasn’t able to do my dream Norweigan hikes of Trolltunga and Preikestolen, but the hikes within Bergen were a worthy consolation prize. We did two during our time in Bergen: Fløyen (one of the most popular due to its funicular service) and Løvstakken. Now, neither of these went without their challenges. Bergen’s dense fog completely covered the view from the top of Fløyen, a real disappointment to say the least for the site’s many visitors, and our descent from Løvstakken was marked by several wrong turns, which almost led us to miss our flight to Copenhagen. Still, we worked our way around both situations. 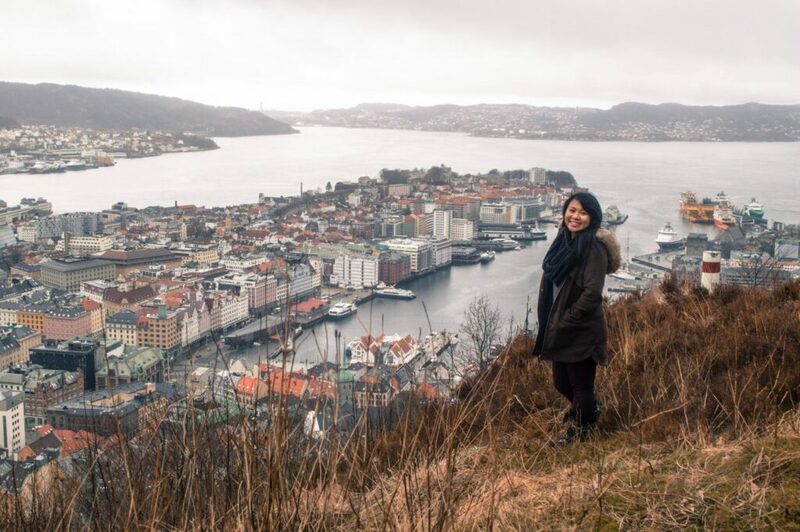 We hiked down Fløyen until we passed the fog and got the dreamy picturesque view we were promised, and then hustled and ran to make sure our flight wasn’t missed on the morning we hiked Løvstakken. I am happy to report that both hikes were successful, and I escaped with only minimal traumatic memories! The unreal view at Løvstakken – worth the stress! … but isn’t Bergen super unaffordable?! 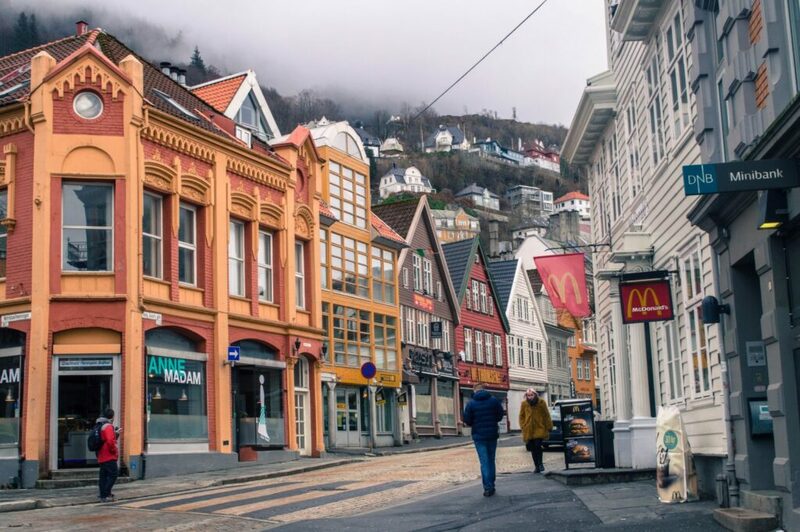 A lot of people don’t visit Bergen (or Norway in general) because of cost-related fears… and okay, I’m not going to sugarcoat it: Norway is expensive, especially so for someone who is travelling. Eating out, having drinks and visiting attractions are a sure recipe for an emptied wallet. In fact, during my time there, I had dinner with some students studying in Bergen, who recounted their epic tales of storming IKEA’s breakfast buffet with tupperware containers in hand, sneakily cheating the city’s high food prices. The struggle, clearly, is real… buuuut (and there is a but)…..
That said, I’ve never believed that any destination should be written off due to one’s budget. 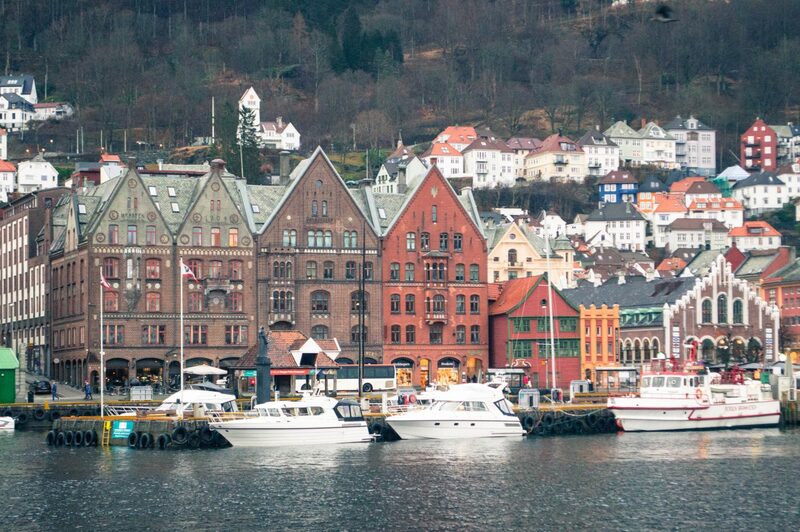 Bergen, like many other pricey cities, can be reasonable if you’re smart about how you spend your money. One of my biggest savings came from cooking for myself rather than eating out. Groceries are noticeably more expensive than elsewhere in Europe, but cost-wise, cooking will always beat dining out. Luckily, the Marken Gjesthus had a big kitchen where I could prepare meals with my friends, and it was a social place to meet fellow travellers as well. On that note, if you’re looking for a budget-friendly place to stay in Bergen, Marken is an awesome option. Not only is it extremely central, the staff are also very friendly and the rooms are both clean and comfortable. A very sweet alternative indeed to a pricey hotel. A sweet surprise from the hostel staff! Last but not least, it’s worth stressing that many of Bergen’s best activities are completely free! 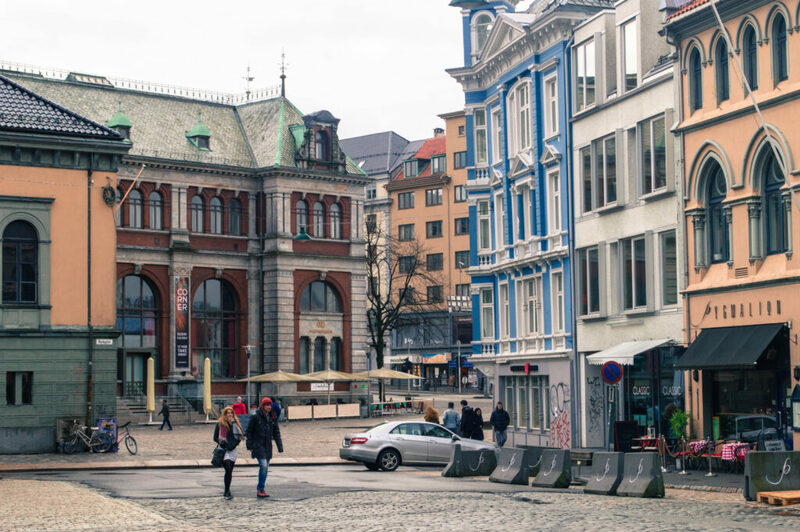 For me, visiting Bergen wasn’t about museum hopping or hunting for culinary treasures… I was more interested in enjoying the natural beauty, and sauntering through the city’s charming little streets. These activities cost nothing and were way more valuable to me than dining out or partying. Now, your turn! Have you ever been to visit Bergen or Norway? If not, is it on your list? 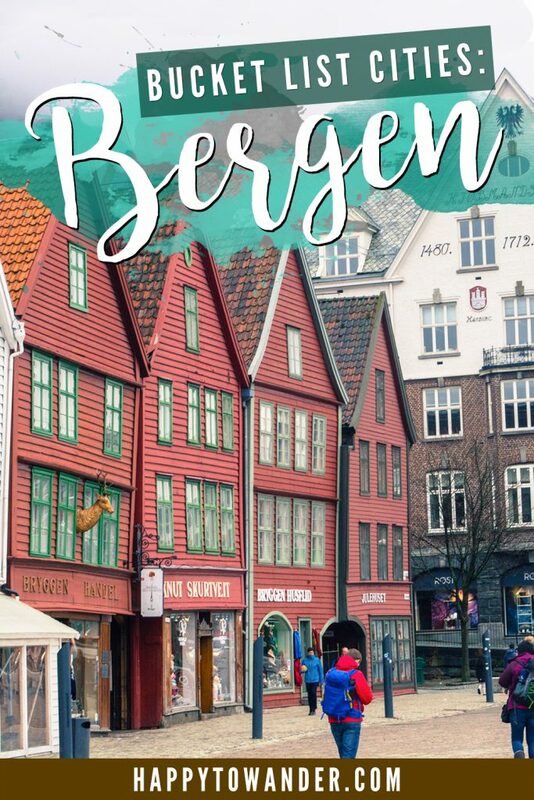 During this trip, I was graciously hosted by Marken Gjestehus and was provided with a Bergen Card by Visit Bergen, but as always, opinions are my own! Thanks for reading, Linn!! Bergen is lovely. I’d love to come back in the summer when the weather’s a bit better haha 🙂 Hopefully I get the chance to soon. Nice post. I’ve been there. Bergen is indeed one of the most beautiful cities in Norway. Hey Christina! Love this post. Bergen has been on my list for quite some time. Have you been to Reykjavik? Your pictures of Bergen remind me a lot of that lovely little Icelandic city! Yes I was in Reykjavik a couple of weeks ago! You’re right – they look quite similar but I’d say Reykjavik is a lot ‘cooler’ and quirkier haha. Both are lovely though! 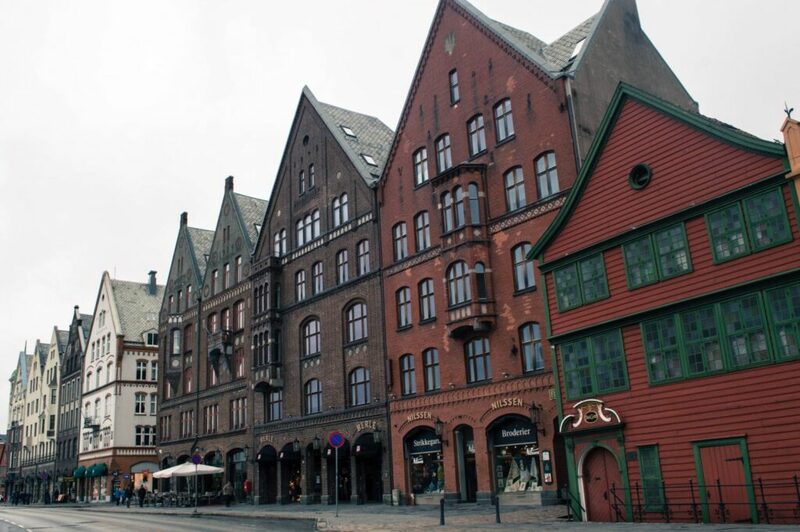 NIce post Christina!i am visiting Oslo and Bergen on June! i just cant wait! Thanks for reading, Vivi! I hope you have an awesome time in Norway. Hopefully the weather is better in June. Be sure to do the train ride between Oslo and Bergen if you get a chance… it’s beautiful! This city is absolutely beautiful. I had always wanted to visit Norway but I had no clue it had cities as enchanting as this. I’m definitely going now! Solid post. 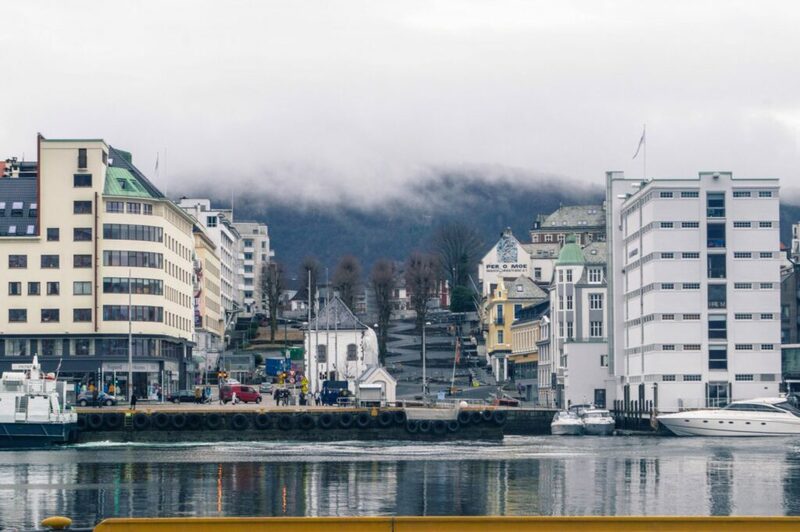 I’ll be honest and say that Norway wasn’t on my bucket list…but Bergen looks like such a place of desolate beauty that I might just have to add it to the ever-growing pile. I can see what you mean about the ‘small town’ feel, and what beautiful architecture too! Thanks so much, Joe!! I’ve been obsessed with Norway ever since seeing photos of Trolltunga (Google it if you don’t know what I’m talking about). What a crazy incredible country! Bergen looks lovely and so picturesque. Norway has been a dream destination for us too. 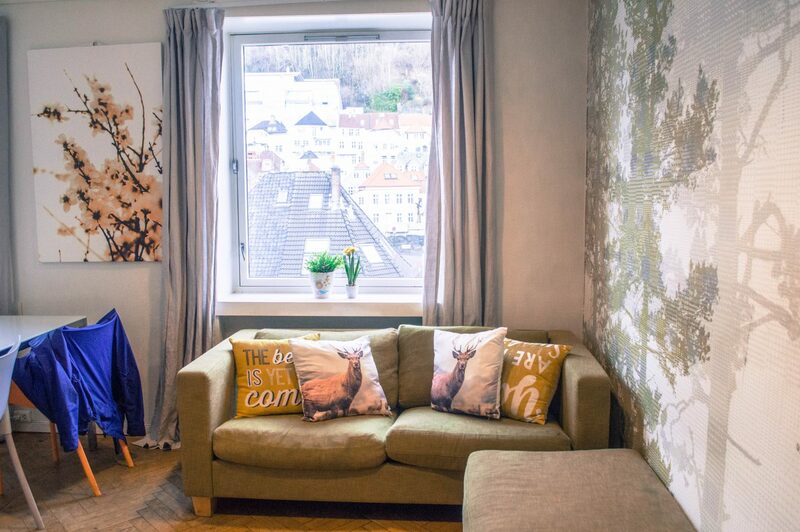 Will make sure to visit Bergen, thanks for sharing this post. Thanks, April!!! Yes it’s not cheap, but it’s worth it 😉 Safe travels! Definitely on my list! Marken Gjesthus looks like a lovely place to stay. I have heard of course of the high prices, but eating in doesn’t sound like an unpleasant option. 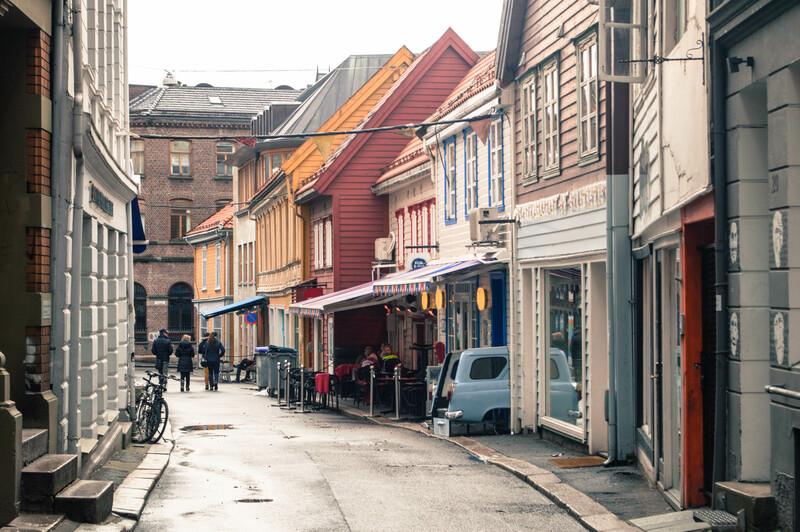 Bergen looks wonderful enough to wander around without having to spend on attractions! haha yeahh I figured I wasn’t necessarily there for Norweigan food or anything, so cooking was fine for me!! 🙂 Thanks for reading, Mar! Hah I LOVED the fjord pun, well played. I’ve always wanted to head to Norway and your photos make it look like such a calm and idyllic little city! It’s so picturesque, I will definitely try and schedule some time to fly over! Love this post Christina, I love this place just to lay back and enjoy the weather in total tranquility. When the sun’s out in Bergen, everyone is out enjoying the weather haha. Such an outdoorsy culture there 🙂 Thanks for reading, Sreeram! Yeah I got a brief taste of sunshine on my last day and wow it was stunning! There were so many people out hiking haha. It IS the rainiest city in Norway though so it’s no surprise that everyone flocks outdoors when the sun comes out. I visited Bergen last month and absolutely loved it. 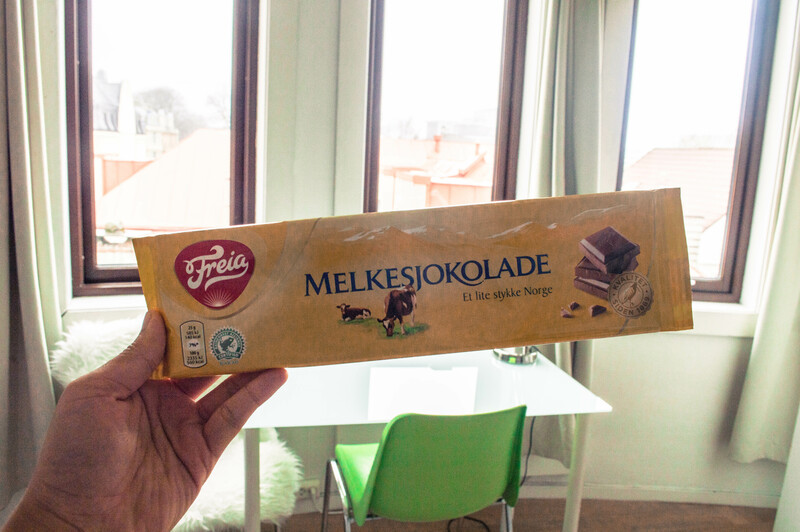 It can definitely be done on a budget as we found that apart from the funicular, many of the activities were free – but it’s the food and drink that will cost you and I think we’d go self catered if we were going to return. Glad you liked Bergen too despite the weather and prices hahah 🙂 <3 thanks for reading! Thank you so much for sharing your experience at Bergen. My wife and I plan to visit Norway in a July 2019 for our 10 Year Anniversary. Like you, we plan to skip Oslo and hopefully can fly straight into Bergen spend a couple nights there, then head to the Fjord region before heading north to the Lofoten Islands. I have been reading up, saving up, and planning this trip for a while now. We plan to rent a car in Bergen and Lofoten. 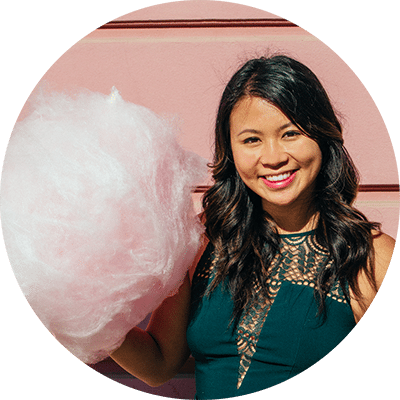 As a travel blogger, I would happily accept any recommendations you personally may have or being introduced to others in your network who may know a bit about this beautiful country. Thanks again, and happy travels!! Christina, I really liked your post. Bergen is a beautiful place. There are colourful wooden houses, fjords, parks, markets, art galleries, museums and restaurants that enhances the grace of the city. 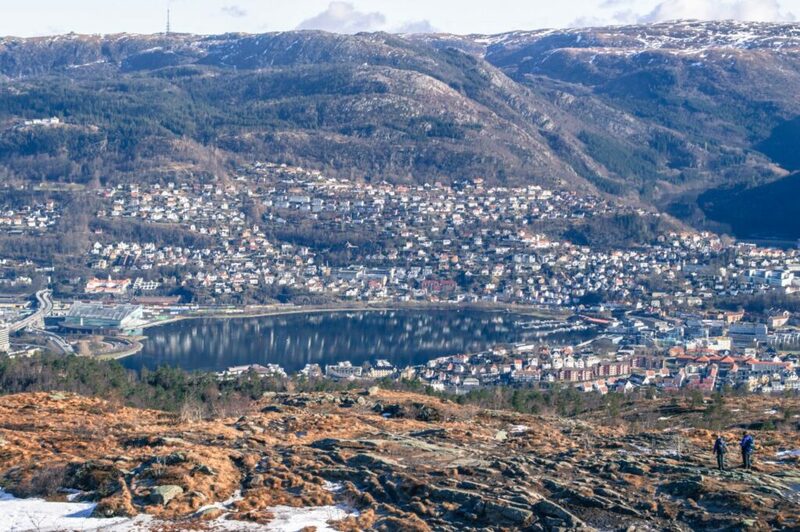 Now, Bergen allows visitors to take Segway tours in the city so that they can visit all the splendid sights of the city and explore the city closely.